"From the heart—may it go to the heart!" 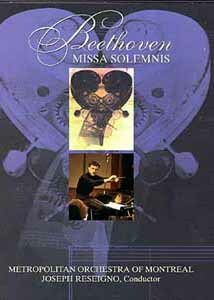 The DVD release of Beethoven's Missa Solemnis, op. 123, by Image Entertainment is nothing short of a revelation. The disk, which features Joseph Reseigno conducting the Metropolitan Orchestra of Montreal gives a truly splendid rendition of the classic mass, taking full advantage of the audio range on DVD. Too often in performances of this work, the title is taken far too seriously and the solemnity becomes overwhelming. However, this performance nicely balances the serious and solemn with exuberance during the Gloria and pleading in the Agnus Dei. I like my Beethoven full of emotion, and this performance certainly delivers emotion in abundance. Reseigno is to be commended for capturing the beauty and meaning of this music so wonderfully. There are a few points where there could have been a little more oomph given to particular parts: the bass solo at the beginning of the Agnus Dei is slightly overwhelmed by the orchestra, and the violin solo in the Sanctus is not as forward as I am used to, but is moving and heartfelt nonetheless. The coughers in the audience, a bugaboo of mine in live performances, are thankfully few and brief. The vocal quartet is, with the exception of the beginning of the Agnus Dei, quite capable and clear; the chorus's enunciation and declamation is among the very best I have heard. Image Transfer Review: The video on the disk is rather soft. Considering that the performance was shot live in a church (what church is not indicated anywhere on the disk), however, it is quite nice. There are a number of nice lighting effects (such as the dimmed lighting suddenly getting bright at "et resurrexit" in the Credo). Occasionally the chorus is lit in green which is rather disturbing, but overall the lighting is tasteful and appropriate. The camera is quite active and shows the musicians from an amazingly broad number of angles; the number of cameras must have been staggering. Also effective is the regular use of superimposition of religious symbols and stained glass windows over the musicians. Audio Transfer Review: While I have heard quite a few versions of the Missa Solemnis, the clarity of the uncompressed PCM stereo track on this disk is completely unparalleled. Over and over I marveled, "Wow, I never heard that before." The various instruments and voices came through distinctly and clearly in just about every instance. The only exception was a brief section of the Gloria, which seemed a little muddy. The Kyrie, Credo and the Sanctus come through quite wonderfully. Extras Review: The extras are quite scanty. Image provides text notes on the mass on the back of the case and the inside flap. There is also a brief (about one minute) spoken introduction given by Reseigno. While appropriately respectful, this introduction doesn't give much of a clue as to the monumental character of the work. Those unfamiliar with the Missa Solemnis may be overwhelmed; a more detailed critical appreciation of the piece would have been useful. Subtitles would also have been helpful in following the Latin text of the mass. I do wish that the disc were subtitled, but this is a minor quibble on a truly marvelous disc, one of the best classical music DVD's I've ever run across. Just don't expect much in the way of extras. Highly recommended for the lover of classical music and essential for the Beethoven fan! !